I do love when a fun project turns into another fun project, don't you? Once upon a time, I designed an industrial (yet inviting!) employee lounge for a corporation located on the Atlanta Beltline. My client loved that space, and decided she wanted to bring Gina Sims Designs home with her. She had a small room, 11 feet by 11 feet to be exact, that housed a queen bed and a lot of junk. It was just that room in your house where all.the.stuff.goes, you know? You've totally got that room. She wanted to add some function, life, and her family to that room. They were in need of a separate space for their 9 year old daughter to play with her friends, a yoga space, and a guest room. Given that my passion is to make spaces beautiful and functional, obviously I was in for the challenge. The design inspiration was rooted in their family's global identity and heritage. She's from England, his family is from Mexico, so we started focusing on how to bring the life of bright, Mexican textiles to the room. I started by painting the room white to allow for brightness and to give the colors full-pop-potential. I also added wall-mounted scones and a new overhead fixture to provide lots of task and general lighting to bring life to the room. While the brightness of the white paint allowed the room to feel bigger than it really is, it was also important not to fill the room with a large bed. Comfortably hosting overnight guests is simply an occasional pleasure, not something that most families can afford to donate an entire room toward. 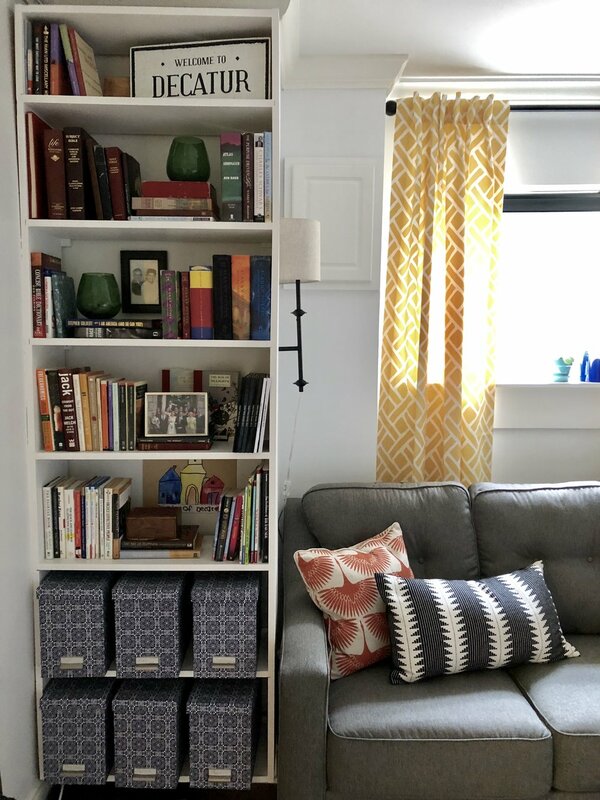 I selected an extremely comfortable sleeper sofa that provided a living-room type feel and function to the room while freeing up considerable space. An ottoman and side chair provide additional seating, and can be relocated easily when the bed is extended. Everything that was previously needed in the office space was placed in file boxes, and beloved books are now on display for easy access. I hung curtains to center the window and those helped to provide a bit more symmetry to the odd angles of the room. I displayed Mexican folk art prints and a portrait to provide a bright and crisp interpretation of the family heritage theme. The family found a photo of his grandfather and mom, and a photo taken at Tulum on the couple's honeymoon: I surprised them by having these reframed for the big reveal. Posters behind the cayenne pepper chair depict the Lake District (in England) and Tulum (Mexico) which are special locations for the family. "It was dead space before. My husband hasn't been in this room for 10 years, except maybe to print something. Now it's been 5 hours since we've seen it and we haven't left! John and I both said it felt like we were in the coolest VRBO! Ha! He loved the pictures of his mom and Grandma and the photo we took on our honeymoon. Make it feel like us! But Cooler. Still don't know how you made our bookshelves look so cool. So Thankful."